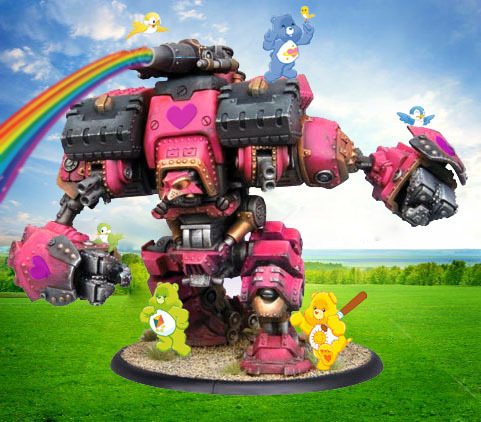 This article was going to be the art of list building for Khador, instead we interrupt your regularly scheduled programming for TALES OF CONQUEST! Conquest (with a C boys and girl(s)) is still being talked about as a big piece of useless resin. I look at the Khador forums again to get my bile going for these articles there was even a thread recently about a guy who has play tested it, found out Conquest was good and most of the thread was about why Conquest was bad and he should feel bad. I will start with the main arguments as to why he is bad. For length reasons I am not going to talk about things like his 9” throw or even the eIrusk Fastball Special tactic (because I think it is funny but unreliable). Stop comparing it to Stormwall or Galleon! … have you gotten rid of the comparisons yet? No? Try again. In all seriousness it is neither of these 2 machines. What it is, is something that Khador have been wanting after for a while. Hear me out. Realise this thing has reach (something dearly lacking from our jacks), it has Pathfinder, it takes all out buffs and loves them. Really it is what Khador always wanted, the ability to be focus efficient by bein 2 jacks in 1 who can get everywhere. Our casters do not like running a lot of jacks (with some exceptions) more so than any other faction. The fact that this is 2 jacks in terms of power and firepower. Stop saying it costs a lot in real Money… I hate this argument as it costs as much as any 19 points you could buy costs. Seriously do the math. Here is the other side, you do not have to buy it. Colossals can be beaten and are beaten by things that are not Colossals all the time. So if you do not want to buy it then don’t, you don’t need it, but it is not a legitimate reason as to why it is bad on the table top. Ok so the meat of the article after my small rant. What do people complain about with Conquest? I will start with Creeping Barrage because I hear more crying about this than almost anything else. It is a single POW 12 gun with AoE 3 that allows you to shoot at the same target twice if you fail to kill or miss. There is a gun on either side of his arc which makes for at least 2 x POW 12 shots. It also has the ability to sac those shots to place 2 x AoE templates down and anything that enters it takes a POW 6. You don’t sound impressed. Did I mention that Conquest is RAT 4? POW 6 is ok, not great but good. I find it amusing that the best use of a POW 6 is against Khador players because arm 11 spam is what you usually see and pow 6’s kill that dead. Ok so on average dice it kills anything up to arm 12 and will make anything up to arm 14 weary of walk through it. If you need to you can use them. They should however be used as a backup and only where you think they will be useful. They are not like covering fire when you want to drop it every turn. If you are up against bane knights they will just laugh at you if you put it in front of them… and they should. It does work as a deterrent or even a straight up denial piece in a faction that has not a lot of it. Another fun thing to do is move your units first and throw the templates on top of them. It does not hit them this way and if they are going to get charged it allows for a nice little POW 6 buffer against non-reach infantry. Again situational but awesome and a fun way to kill daughters attacking your IFP. He has a big cannon which has Critical Devastation which may or may not be the best critical effect in the game. However Crit is not what it has cracked up to be. 44.44% average on 3 dice is not something to bet on, good if you are trying for the long odd but unfortunately that 44.44% is if you include low numbers as well, and with a dismal RAT 4 things look bleaker and bleaker. It is a range 15 pow 15 AoE 4 monster. Seriously what is not to like here. The Crit Dev is just gravy. It is a nice topping to a nice gun. It puts hurt on infantry, it puts hurt on jacks and if you are lucky it puts a critical effect on anything. It can reach out and touch you from a mile off. Well we meet again synergy argument. Ok I will start this by saying, everything in the game requires a certain amount of synergy. If everything in your list does not support something else you are building it wrong. So, what I have heard Conquest needs. Gorman, eEyriss, Max unit of Mecaniks, a Koldun Lord, Ayianna and Holt… I can’t be bothered listing the rest to be honest because it is pointless. Yes the things above provide synergy and do some pretty cool things most of them you would most likely be taking anyway. Not only that but after extensive play testing the only thing I have found the Conquest NEEDS is a min unit of Mecaniks (making him a 21 point warjack which can repair himself for a lot of damage). I use the expression a lot but the rest is Gravy, Eyriss can knock off debuffs but she is not necessary but nice, a Koldun Lord can give it focus which is nice too, like everything else on that list. If you prefer the extra synergy take it, if you don’t want it because you want to beef the rest of your list, do that. Here I am going to spout the virtues of a speed buff and jack buff spells. I will keep it short though. He likes Superiority (because it is a jack buff spell) which is great, infernal machine is also good for this reason. He pretty much wants to go fast any way possible. pVlad can make him charge a mile, Boundless charge from a lot of our casters, Infernal machine, Superiority. Yup he just wants to be faster and since he will mostly likely not be fighting for attention, give it to him and watch him rip people apart. He will give you a board presence which is hard to ignore. His ability to make people come to him with his big guns is great, but so is his ability to get into the think of it and live. Mecaniks are great for keeping him alive. You can hide our more squishy casters behind him and generally have a good time with that and if he dies, you can hide them in his wreckage. Always fun. Love him, for he can be your best friend. He is not for every list but damn it if he is not a great jack. He has been added to the stable of jacks khador are willing to take on a regular basis and that is awesome. Well worth the entire 21 points. I have been playing wargames since I was 16. Once I discovered Warmachine and Hordes I have been all over it ever since, dropping all of my other games. I love my Khador and almost any other army you put in front of me. I hope over time I can build up a decent faction guide, if you have any questions you want answered let me know.